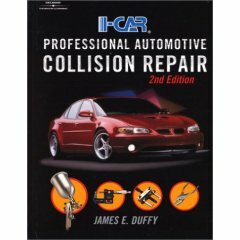 This popular comprehensive introduction to automotive collision repair has been revised to include a new, full-color painting and refinishing section. In addition to all-new illustrations, coverage has been added to include the latest high-efficiency spray guns, gravity feed spray guns, and surface preparation materials and methods. The mechanical repair section has been revised to include scan tools, OBD II and the use of refrigerant recovery stations. Each service-oriented chapter now is accompanied by a practice ASE test featuring numerous ASE-style questions. Accompanying the book is a thoroughly revised Technician's Manual including an all-new section with exercises related to NATEF's related academic areas including communications, mathematics, science and workplace skills, in addition to numerous job sheets for lab activities. New technology throughout shows state-of-the-art in collision repair. Full-color refinishing section, and new photos adds to the content value of artwork. Latest in Scan Tools, OBD II, Refrigerant Recovery Stations, and other repair-related topics focus on current issues in collision repair.